We’re delighted to be working with Saintseneca for the first time – and new venue YES! 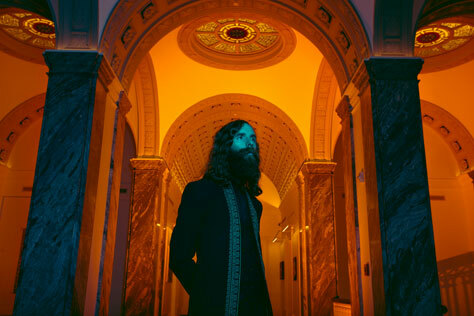 Saintseneca’s Zac Little has been thinking a lot about memory. Not necessarily his memories, though they creep in often too. Rather, he mulls over the idea of memory itself: its resilience, its haziness, how it slips away as we try to hang on, the way it resurfaces despite our best efforts to forget. Memory is the common thread running throughout the Columbus folk-punk band’s fourth album, Pillar of Na, arriving in late summer via ANTI- Records. Following 2015’s critically lauded Such Things, the new album’s name is rooted in remembrance, referencing the Genesis story of Lot’s wife who looks back at a burning Sodom after God instructs her not to. She looks back, and God turns her into a pillar of salt. ‘Na,’ meanwhile, is the chemical symbol for sodium. ‘Nah’ is a passive refusal and the universal song word. It means nothing and stands for nothing. It is ‘as it is’. Like Lot’s wife, Little cannot help but revisit where – and how – he grew up. Raised in church in southeastern Appalachian Ohio, he took up preaching when he was still a teenager, sometimes in small country settings and other times to congregations of thousands. But these days he’s more interested in listening. And questioning. Local support comes from South Island Son. Setting up home in Manchester’s Northern Quarter, the South Island Son boys have had a busy nine months in office. Since their debut sell out gig, the band have been busy picking up airplay on BBC 6 Music and BBC Introducing, and touring in France following their single Down The Slopes as well as cropping up at festivals during the summer.